For the first time since it was plugged in, the Moor Park Apricot is in blossom. I did check, and there were all of three delicate looking white blooms. Three! Alas, I am not holding my breath. Last year, the peach tree also blossomed-it’s getting leafier as I type-only for the frost to nip at it. Therefore, I am not holding out too much hope that the Apricot will set fruit; I probably should drape it in fleece. Only I end up having a full scale heated debate with Mama F as to the why’s and wherefores. That, and it looks as though Casper and friends are floating through the plot. I will keep an eye on the Apricot and see whether additional blooms burst and then make a decision about draping the tree in fleece. The pear tree is also looking a bit frilly with blossom, the stella and morello cherry trees aren’t too far behind. In contrast, the apple-falstaff and braeburn-appear to be behind and are only just starting to get leafier. As with Apricot, there has been limited success with the pear. Last year, we had all of two pears; they met their end in a chutney. I am therefore, a little surprised by the arrival of blossom. I might find myself fleecing things sooner rather than later. 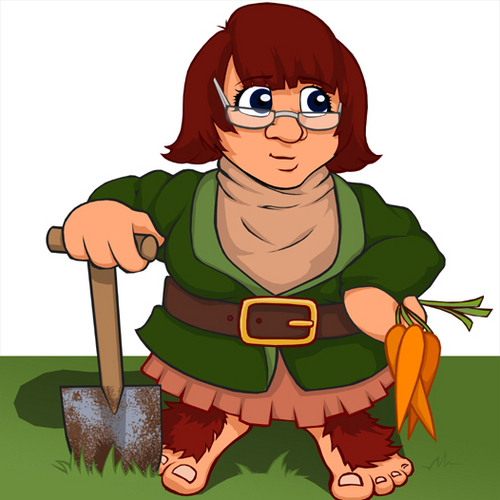 In other news, Mama F has sunk this years spuds on her allotment plot; leaving me to fiddle with the raised beds and plot this year’s course of development. At the moment, I have seedlings on the window sills. At the moment I have clara and money maker aubergines. (My thanks to Gifts You Grow for the money maker). As well as Roma and Marmande tomatoes and an assortment of Cayenne. These are precariously leggy in some cases; sown when light levels were at bit rubbish, this was always going to happen. I am hoping that moving them from one side of the house will help the plants fill out and become robust. There a plans; the sort that change and with reflection. 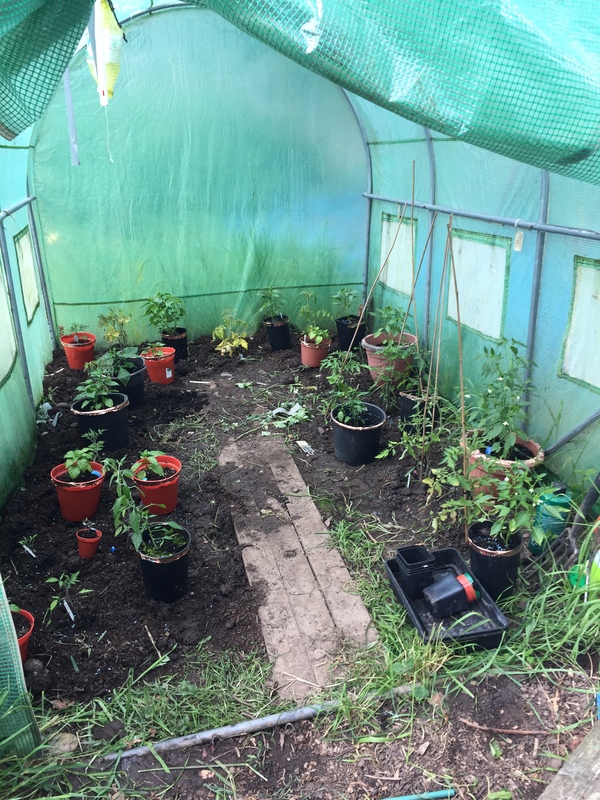 In the long term, I would like to fix my poly tunnel and get some more raised beds. Having one half of the plot, that is open ground and not very productive doesn’t feel right. So before the end of the year, the second half the plot-the one where we have the roses and trees should have some raised beds on it. This will mean negotiating with the raspberries and strawberries that are are currently ‘up there’ someplace. I am looking into a new cover; though I might have to borrow Mama F’s poly for this growing season. 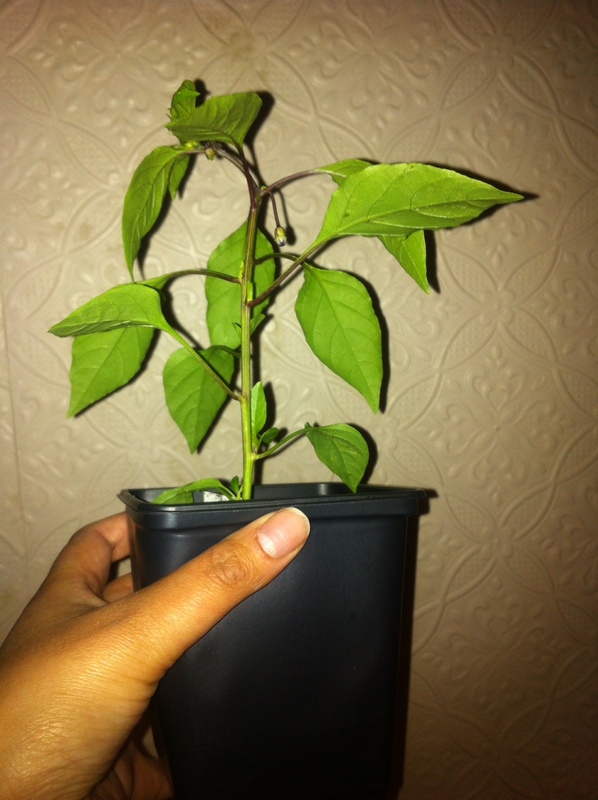 She likes aubergines, I do not; so she can play with them…and my chillies…I will of course babysit them accordingly. I do get rather precious about my chillies. On the seed sowing front, I would like to sow some more tomatoes. There was an rather conservative sowing at first, so more Roma and Marmade are on the cards. I would also like to sow runner beans and climbing French beans; it is too early yet, I made that mistake last year. I might even try peas, though that is debatable. Before long, it will be May and I will nervously eyeing the closing of the frost window. I will be deciding on this years squashes; we have yet to sacrifice a pumpkin from last year, so there will be seed selection. I have had a good look at the current raised beds. One third of them are cleared, with the others full of stubborn grass that will need an aggressive intervention for removal. It is simply not the sort to be pulled out by hand. Over all, there does feel a more systematic and organised approach to doing things this year. It would be easy to be defeated, and I think for me personally I need to take a step back and take time to do things slowly but surely. It will all get done, just not at break neck speed. Now, if you’ll excuse me; I have counselling key terms to generate-spiral notebook, ink pen-and maybe some Buffy season seven to put on in the background. I might even re-paint my nails. And yes, if anyone knows of allotment proof nail varnish, send it my way….seriously! The chillies are rather happy in the poly tunnel at the moment. The vast majority are now starting to form flowers and fruit. 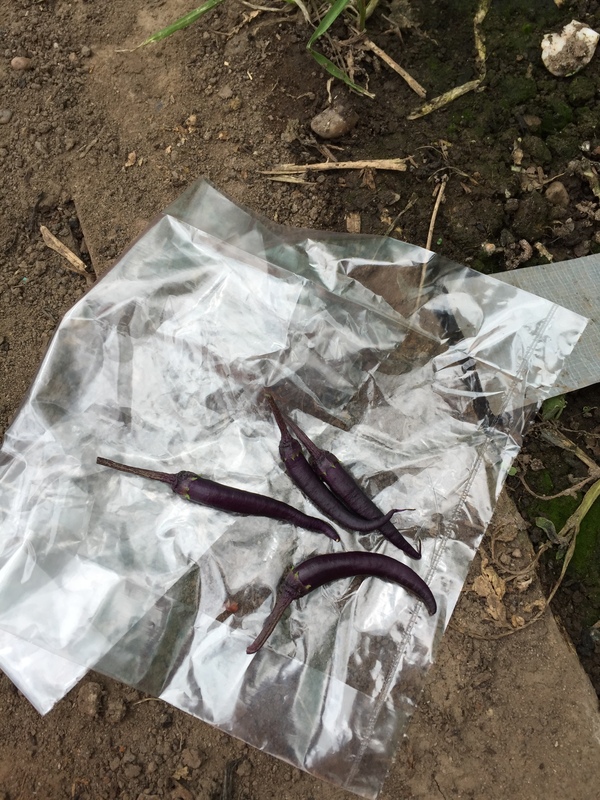 As you can see, we have a handful of purple haze chillies. They are unripe in the picture, as they go red when they are ripe; however I used these to make a chutney. The Dorset Naga is now sending out the tiniest of buds and also the most delicate of white flowers. I have yet to successfully have a super hot, and this one was bought as a plant. And then just as you are wanting to exit the poly, you see a fluffy bumble bee having a play in the apricot chilli pot. This week, it has been attack of the aphids. The plants that had so far been coddled, have suffered an infestation. The horrible little green creatures have been hanging around the habaneros, and it’s not very nice having to squish the little critters who leave your plants sticky. The plants in the poly seem to be okay, getting used to being in there. For now, they like the spuds in there, are fleeced for their own protection. With there still a possible frost til the end of May, I am taking no chances. Purple Haze now has two flowers, and the other standard cayenne has also got singular chilli white flower that has just opened up. All of the pots, were decorated with the oh so pretty looking slug tape. yet one, brighter than expected slug has managed to take a chunk out of a bellaforma chilli leaf.I hope that slug dies a horrible death. 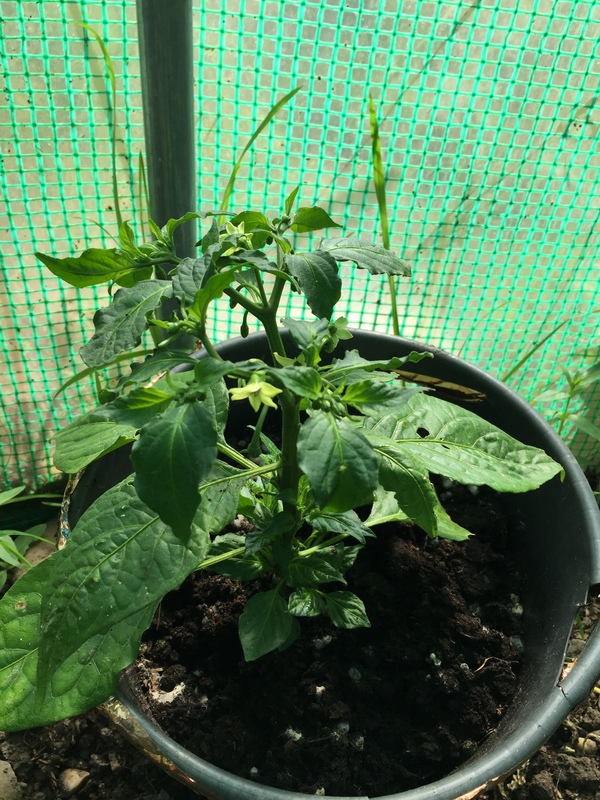 I am hoping that the habaneros that remain at home get a spot taller and bigger. Then, like the others, they will move into the poly. The night before last, we had a horrible frost. Yesterday morning, I was cursing the elements having to scrape a thick sheet of harsh frost of the car before going to work. 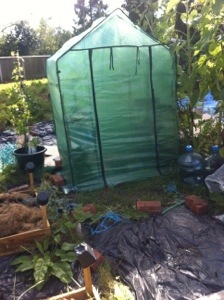 Naturally, my thoughts hit upon the chillies that I situated into the poly tunnel the afternoon before. This morning, having worried about them all day, I went to see if they were alive. I had fleeced them, in the same way that the tomatoes are covered. You can see in the top left corner of the photograph, the fleece is there. This was tented over the four pots as a protective measure. Having scraped off the ice on the car, I was worried that these things had been zapped to within an inch of their so far very short lives. This is the purple haze cayenne that I bought from sea spring seeds at the edible garden show last month. That tiny little bud in the middle, that’s a flower. There a couple more tiny ones waiting to develop. That’s if the blasted Aphids don’t kill it off. Also, this is a very small plant still, I’m not too sure if it is supposed to be sending out flower buds. Perhaps it’s a bit comfortable in the 12cm pot. The habaneros were sat in 7cm pots, and whilst they have started to pick up; some of them were trying to escape their pots. So they have all now been re-potted into 12cm pots. I think for all the chillies on the sills, this is probably their last temporary pot before they get their proper pots in the poly tunnel. The hope being, that they make it through the next six weeks and into the summer. Yet another chilli post, yes. 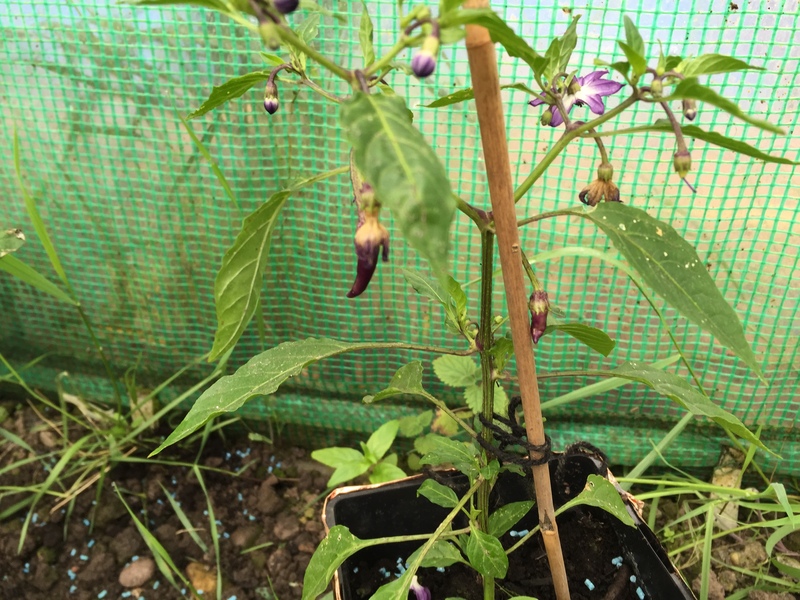 Today, I made the decision to pot up some of the taller chillies.The purple haze and cayenne peppers have even started to develop flowers, suggesting that they are actually quite happy. However, there was a spot of drama with the cayennes, when I left them in a very warm conservatory, and they nearly keeled over and died. I had to promptly re-hydrate them and pray to the chilli Gods. When I say taller chillies, this means the likes of aji limo and hungarian hot wax. These are also the earlier sown chillies, compared to the smaller, slower growing habaneros. Given how comfortable these are, I need to consider how and when the next pot up stage will be. Today, the plants were moved from 7cm pots to 12 cm pots, and are easily 5 inches tall. Suggesting, that there might be one final pot up or they will go straight into tall morrison flower buckets and into the poly tunnel. The smaller habaneros, are still in 7cm pots, and I am loath to transfer them straight into the the large flower buckets. These I think, will need a larger pot soon, but not yet the big roomy ones.Just need to work what I am going to do next with them. I don’t want them to become too rootbound, and to be fair, they aren’t go upward as much as I would like. NABLOPOMO would be fairly replete if I didn’t mention the chillies. Let’s face it, they have had a lot of blog space dedicated to them as we experienced inclement elements out doors. We have a number of chillies this year, largely habaneros. These were sown very late December and very early january. All in yogurt pots, sat on a warm window sill, covered with a food bag. These were then eagerly,slowly, observed, and have been pampered ever since. For now, we have a number of leafy specimens. There have been tantrums, when the odd one has crinkled up dehydrated. The one thing that I was surprised by, flowers. The cayennes and the purple haze have already started to produce little flower buds, with the plant’s themselves being quite diminutive. Suggesting, that they are a bit happy. None of the plants are in the final pot yet, and it’s still a little cold at night for them to be in the poly tunnel where they are eventually going to reside. Potting them up,will cause them discomfort, and slow down their growth. Not really a problem, as it would be useful if they were bigger and a tad more robust before they are put into their final position. At least if they are bigger leafier, more robust, they have more of a chance in being able to defend themselves. I would say that they are probably one pot away from the final pot. The final pot, is likely to be one of those black morrison’s flower buckets. Dad has already been kind enough to have drilled drainage holes through the bottom. Those I believe are big enough for the root system to be developed and constrained enough at the same time. Though I might think about the plants getting a little taller, having them acclimatise gradually to night time temps in the poly, pot them into the black buckets and watch the plants grow into the buckets that way. The habaneros are still quite small, in comparison to the hungarian hot wax and cayennes. The hungarian hot wax and cayenne are comparatively faster growing, so that accounts for some of the difference. This, I suspect, also translates to flavour. With the tomatoes thrown to their possible impending doom into the 4TB, there has been a window sill shuffle with the chllies. 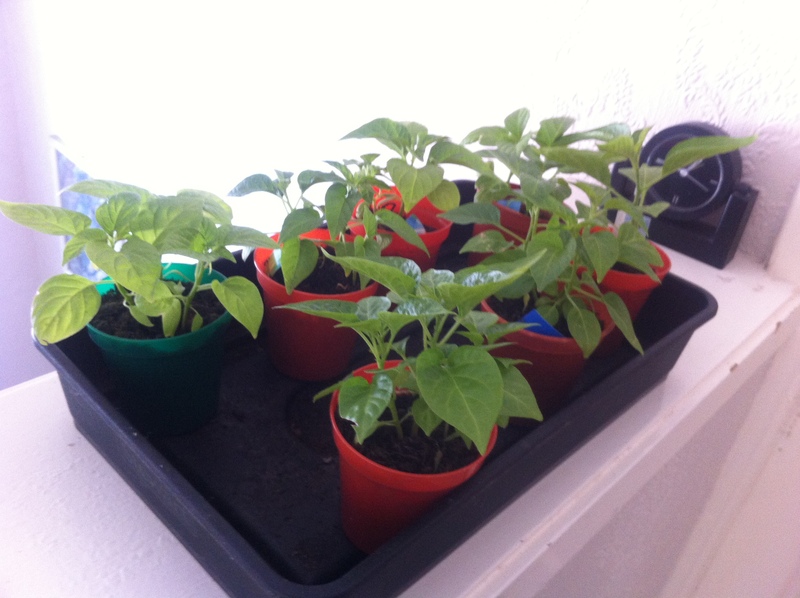 The larger chilli plants are serrano, cayenne, aji limo and hungarian hot wax. The habaneros bring up the rear in the second smaller batch. I have left the habaneros where they are, but others have moved to a cooler spot. Mainly because they are trying to escape their pots and I don’t really want to pot on too quickly. 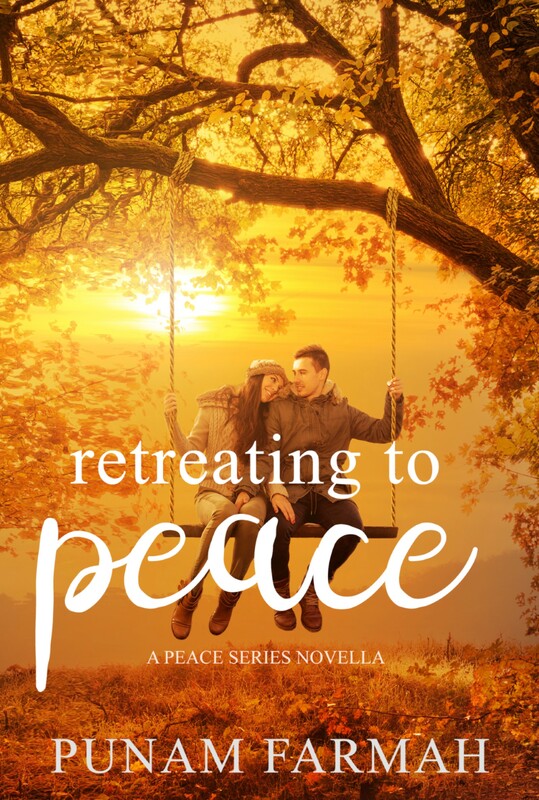 They get comfortable, and things start to go a bit awry. I have found, through observation, that the cramped drier conditions foster a more positive outcome. Plus it is only nearly the end of March. I don’t want to plant these out into the Poly tunnel in bigger pots just yet. The wendy house also needs tidying before I do that too. That is the wendy house blow, when the one side did actually do up. Ah yes, I need to repair the door. I am not buying another cover. Why is it, that I always take the one door of it’s hinges? I have done the same with the 4TB….meh. After what has been an intense week, things are getting back to normal. 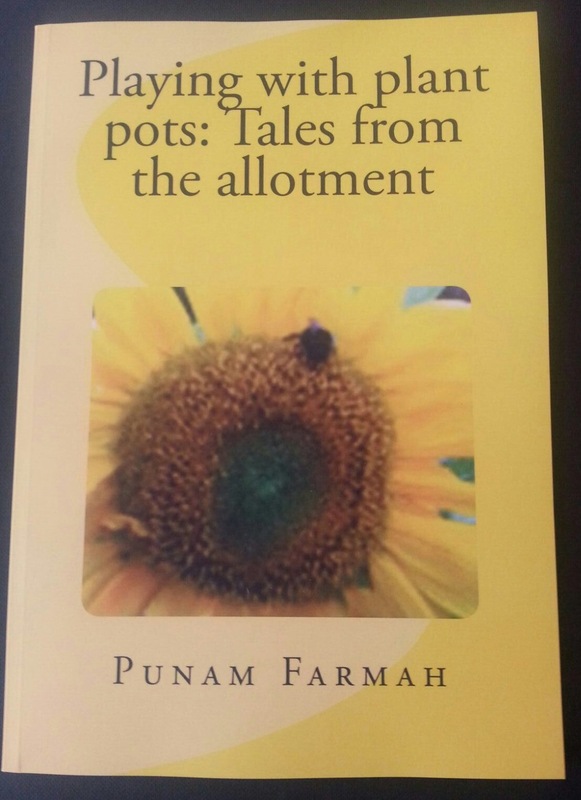 I have found myself some compost, and got around to potting things up. 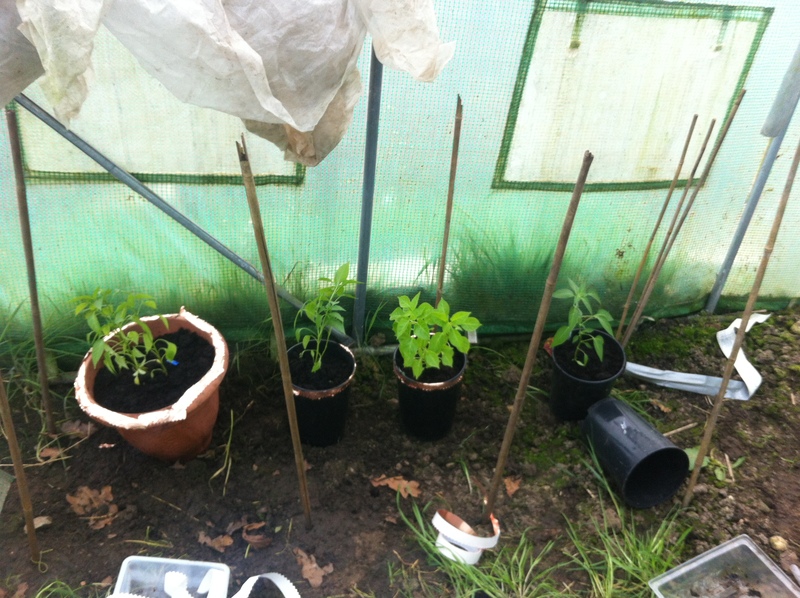 The tomatoes were looking as though they were ready to bend and break, so needed to be potted up as matter of urgency. So putting down some newspaper-i did it before my mum instructed me to, and I even hoovered up after-I set about potting up. I’m not very good at potting up, as you may have garnered. I even managed to decapitate one of the true black brandywine seedlings. To be fair it had already started to keel over a the soil point in having grown leggy. There was no hope for it anyway. Therefore, potting up is something of a delicate operation. I had to concentrate, so pops got a bit worried when I was walking around wearing a scowl and looking rather unhappy. That would be my concentration face. The tomatoes were planted deep into new pots, right up to or close to their baby leaves. There are still another dozen or so baby tomatoes that are still at their baby leaf stage. But these were starting to send out their second or third set of proper leaves. They still have some time yet before they are move. I daresay that they will probably be potted up once more before they get planted into the poly. Then, then we have the chillies. You have heard a fair bit of them lately. But they too needed potting up to varying levels. They are all incredibly leafy, and healthy looking. I did have a mild panic when earlier this week, a couple of the specimens were a bit wrinkly and dehydrated. So had to have a lot of water poured into their gravel tray. I rather like my chilli babies, and will be heartbroken if they keel over. Most of them now look a little more respectable having graduated from their yogurt pots and into the 7 cm pots. 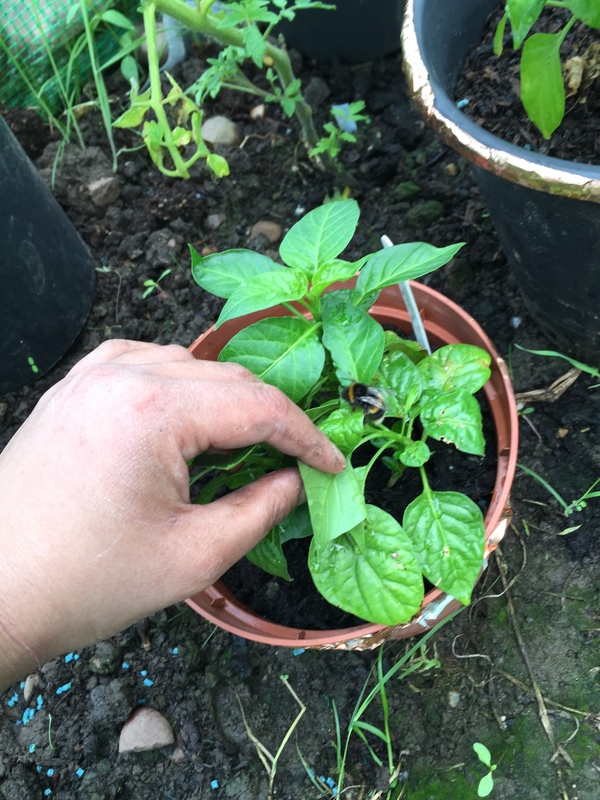 The habaneros were also potted up, they are sending out leaf pairs three and four, even though they are smaller in size compared to the rest of their cohort. I think that is trend for habaneros, as the other varieties are growing at a much speedier rate. I also had not realised quite how many Hungarian Hot wax chillies I had sown. There a number of Aji Limo, together with few cayenne babies.